There will be 24 teams in the tournament with the finals played across the continent. The semi-finals and final will be at Wembley. 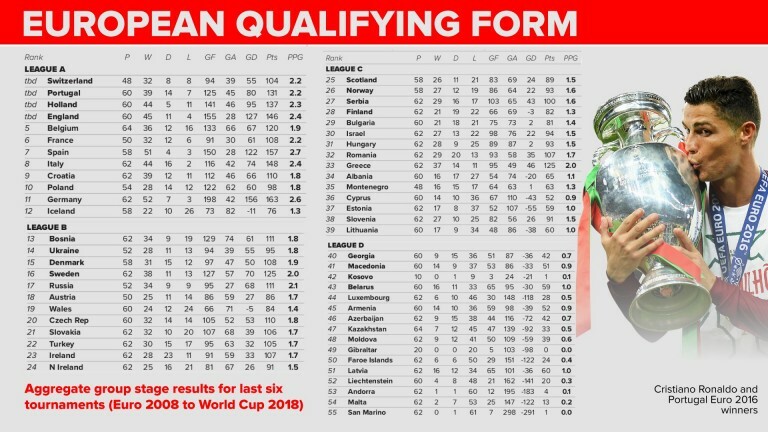 How do teams qualify for Euro 2020? The top two teams in each of the ten qualifying groups will automatically qualify for the finals and the other four places come from the Nations League playoffs – more of which later. What are the Euro 2020 qualifying groups? Group C: Holland, Germany, Northern Ireland, Estonia, Belarus. Group D: Switzerland, Denmark, Ireland, Georgia, Gibraltar. Group J: Italy, Bosnia, Finland, Greece, Armenia, Liechtenstein. What is the Nations League format? Teams who don't qualify automatically for Euro 2020 still have a chance via the Nations League playoffs. There will be four separate playoffs – one for each league from A to D – with one-legged semi-finals. The higher-ranked team will be at home in the semis before a one-legged final to decide the four remaining spots. Countries who did not win their Nations League group could still find themselves in the playoffs to help fill up the respective paths to the finals. These places will be handed out to the highest-ranked sides (see below) who have not qualified, although a playoff path cannot be completed by a team from a higher league. For example, Wales, who are ranked 19th overall, may well end up in the playoffs if they miss out automatically as most of the big nations above them are long odds-on to secure a direct-qualification path. A nation from League D will reach the finals – at least one of Georgia, Macedonia, Kosovo or Belarus will definitely qualify. What are the rankings from the Nations League groups? League A rankings in order (*certain of at least a playoff spot): *Switzerland, *Portugal, *Holland, *England, Belgium, France, Spain, Italy, Croatia, Poland, Germany, Iceland. The top four places in this league will be completed by the results of the Nations League finals in June but the finalists will fill the top four berths. League B rankings in order: *Bosnia, *Ukraine, *Denmark, *Sweden, Russia, Austria, Wales, Czech Republic, Slovakia, Turkey, Ireland, Northern Ireland. League C rankings in order: *Scotland, *Norway, *Serbia *Finland, Bulgaria, Israel, Hungary, Romania, Greece, Albania, Montenegro, Cyprus, Estonia, Slovenia, Lithuania. League D rankings in order: *Georgia, *Macedonia, *Kosovo, *Belarus, Luxembourg, Armenia, Azerbaijan, Kazakhstan, Moldova, Gibraltar, Faroe Islands, Latvia, Liechtenstein, Andorra, Malta, San Marino. Do we know who will meet in the playoffs? Unfortunately not. As it stands Scotland would face Finland in the League C playoff semi-final with Norway meeting Serbia before the winners clash in the final. However, that could change depending on whether any of those nations qualify automatically. The one-legged semi-finals and finals will take place in March 2020. When is the Euro 2020 finals draw? The draw will be made in Bucharest on Saturday, November 30 but some groups will not be fully known until the playoff results in March. What is the Euro 2020 finals format? There will be six groups of four teams. The top two qualify for the last 16 and they will be joined by the four best third-placed teams. 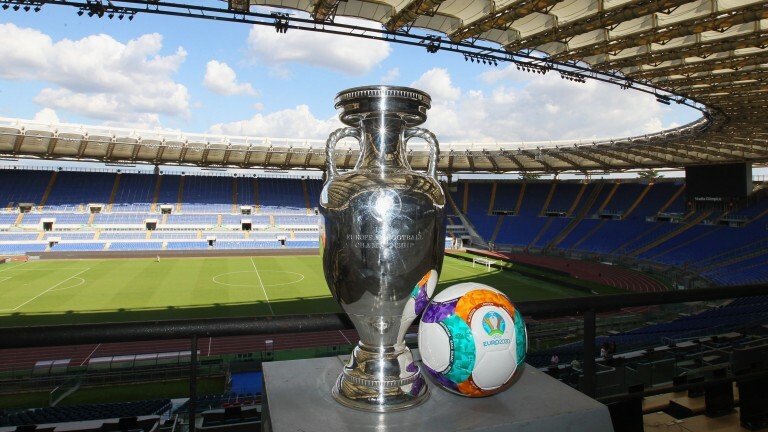 Which cities will be used for Euro 2020? London (Wembley), Munich (Allianz Arena), Rome (Stadio Olimpico), Baku (Olympic Stadium), St Petersburg (Gazprom Arena), Bucharest (Arena Nationala), Dublin (Aviva Stadium), Amsterdam (Johan Cruyff Arena), Bilbao (San Mames), Budapest (Puskas Arena), Glasgow (Hampden Park) and Copenhagen (Parken Stadium). Each city will host three group-stage matches and one game in either the last 16 or quarter-finals before the semi-finals and final at Wembley. When does Euro 2020 start? The tournament starts at Rome's Stadio Olimpico on Friday, June 12 with an 8pm kick-off UK time. When is the Euro 2020 final? The final will be at Wembley on Sunday, July 12 at 8pm UK time.